I taught Cost Accounting for many years. I always had fun (okay, fun here is measured in the range of possibilities related to teaching accounting) covering the subject called Return on Investment (ROI), especially when it applied to selecting new products to add to your Product Mix with the goal of Maximizing ROI. The problem with trying to maximize ROI is that you are trying to maximize a percentage, and you can’t put percentages (as opposed to dollars) into the bank and pay your bills with it. The interesting part of the story (again, relatively speaking) is when managers make suboptimal decisions. A suboptimal decision is one that is in the manager’s (or his/her division’s) best interests, but not in the best interest of the company as a whole. Yesterday, President Obama unveiled the first glance at his plan to give higher education an extreme makeover. Light on details, the plan does cover lots of ground, much of which would definitely upset some of the apple carts in higher ed. Trying to get a jump on the Tea Party – let me dub his plan “ObamaEd,” although I’m also quite partial to Obama.edu. ObamaEd is probably DOA in Congress, if for no other reason than the fact that he proposed it. Therefore, the two factions of the GOP will oppose it, even though it feels much more like a GOP-colored proposal than one from the other side of the aisle. ObamaEd is an attempt to hold colleges and universities more accountable for the federal dollars that flow into their coffers. Fair enough, I guess, but as soon as you start changing things like funding formulas, people start trying to find a way to game the system. Here’s one of the more significant proposals in ObamaEd. Let’s just focus on the idea of basing the college ratings on the earnings of the graduates from each college. Not sure how big a role this will play, but let’s guess for now that it could be a significant factor. 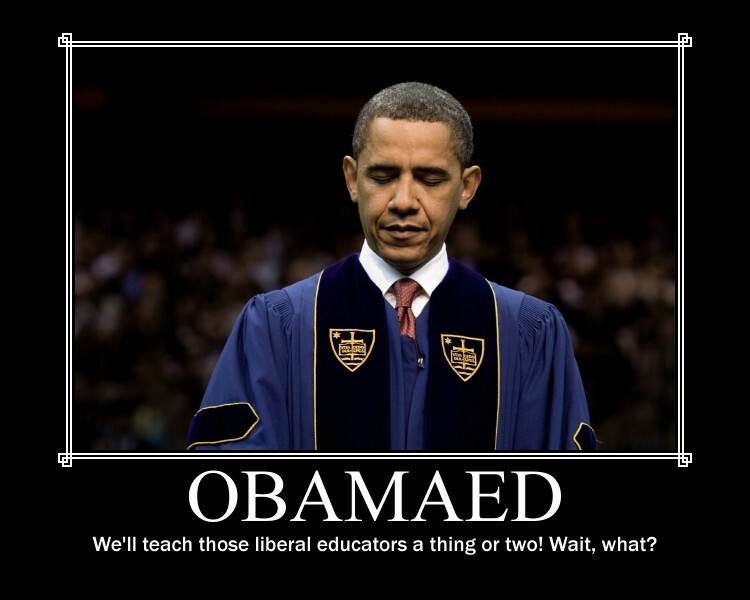 How do colleges game ObamaEd to their benefit? It’s really pretty simple. Start by cutting the programs with lowest rates of earnings for their grads. The earnings for the graduates of institution will be based on the average of all the different programs lumped together (or so it would appear at this time). Let’s take an example from the great state of Tennessee. Using some of the data from a recent report by CollegeMeasures.org, here are a few of the programs at the University of Tennessee-Martin. I’m leaving out some of the detail, but the data below should illustrate my point. You don’t have to be a cost accountant (although it helps) to figure out that if you eliminate the History program, your average earnings for grads at the institution goes up. Think of the $37,140 as being a weighted-average (which means that it is weighted by the number of grads in each major) of the earnings of the grads from all the programs. Get rid of the lowest-earnings program and your average goes up, and your federal rating goes up. The poor Psychology program is next. If it worked for History, it’ll work for them, too. In fact, mathematically it will work for every program below the average. Just to add more intrigue, as you eliminate the lower programs, the average continues to go up, so that some programs that started out above the average, are now below the average and are now on the possible chopping block. If you carried it to the logical (okay, that’s a matter of opinion) conclusion, you’d cut everything except the Health Programs (uh oh, that’s another grouping of programs where some are better than others) and UT-M would now have grads that earn an average of $58,592 their first year out of college. Would this be a suboptimal decision? Sure sounds like it. Would this actually happen? Probably yes, if we’re talking about cutting some of the lowest programs to bring up the average. Probably not if we’re talking about cutting everything except the highest performer. However, you do need to be careful what you ask for. 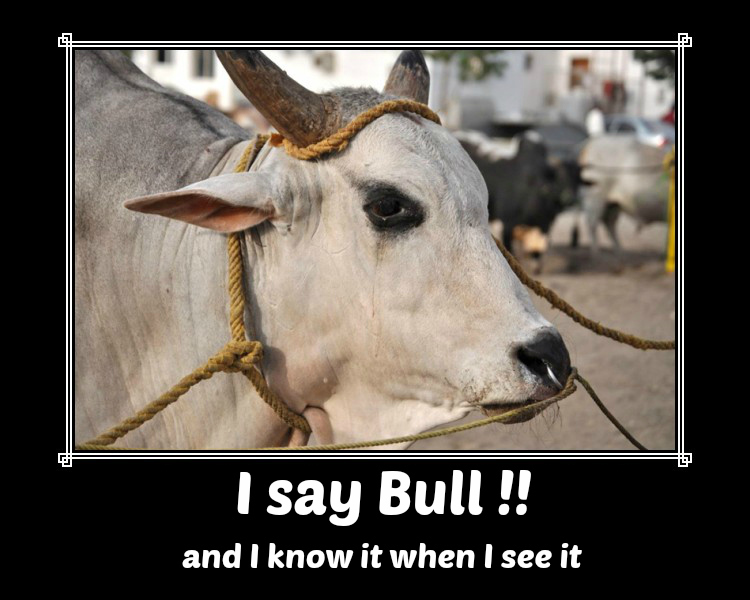 I Say Bull ____ !! I haven’t been posting here much lately, but there are so many things that I want to say about what I’m seeing in this increasingly insane world, that I feel compelled to start writing some of it here – if nothing else for my own sanity (what’s left of it). Have you noticed the explosion of infographics on the web lately? Are you still breathing? If so, then you’ve noticed. You can find lots of very positive (glowing, in fact) web articles about how to use infographics as link bait. That is the number one purpose for an infographic, to drive traffic to somebody’s website. I get several emails each week asking me to embed/share some infographic on my site. The emails are slowing down now since I don’t respond (positively) very often, and also because if I choose to respond it is usually to tell them how wrong they are. Are you familiar with the Telephone game? Also called Grapevine, the Operator Game, or this culturally insensitive name. You’ve probably played this game from time-to-time, either as a planned activity or just accidentally. This is where you whisper something in the ear of the person next to you, they whisper it to the next person, etc. etc. until you get to the end of the line and a very different phrase (often, anyway) comes out of the mouth of the last person. That’s analogous to what I see happening more and more with the crazy explosion of infographics on the Internet. They take information (often, anyway) from a source and twist it around until you cannot recognize it any more. Here’s a recent, classic example from one of the several SEO trolls (see Infographics as link bait) that are trying to make money out of being a middleman in the higher education (usually online learning) market. I won’t link to them because that could be a good thing for them if I drove eyeballs to their site. Instead, I’ll share a few snippets from their recent infographic on the Evolution of Online Schooling. 1950, really? Seems odd since Henry Ford (THE Henry Ford) died in 1947, at least if you can believe Wikipedia. Could it be that they were talking about his grandson Henry Ford II (not HF III, which is weird)? Actually, it turns out that they are talking about the Ford Foundation. But when you invoke the ghost of “Henry Ford,” you should be talking about the real deal. Seriously? This has something to do with international education? Someone please enlighten me. One of their sources mentions CAPA, but doesn’t say anything about “ushering in international online learning.” Another source mentions CAPA, but also says nothing about what the infographic claims. There’s a reason why this doesn’t make any sense. Turns out that there is a CAPA International Education organization, founded in 1972. The only problem is that it has nothing to do with the CAPA online learning program (now called LON-CAPA) developed in 1992. And yet thousands (just guessing) of people will look at this and think they’ve learned something. This one leaves me speechless. The first MOOC was in 1994? That’s pretty good considering that the term was coined in 2008 (see page 12). And if you’re going to proclaim something as the first thing that “sort of sounds like what we today call a MOOC,” then you can find lots of things that came earlier than this. This just shows an incredible lack of knowledge. USA Today uses the headline “Online Education Degrees Skyrocket” in an article about how the four institutions awarding the most degrees in the field of education are online schools. They further state that those four online institutions granted 6% of the total bachelor’s degrees in education (“one in 16”) and 9% of the total graduate degrees in education (“one in 9”). They fail to say (because they probably can’t find the data) what percentage of the total education degrees were awarded by all the online schools, or even what percentage of graduates earned their degrees online. Techcrunch cites the USA Today article in an article with the headline of “Online Education Degrees Now Dwarf Traditional Universities.” First of all, I’m not even sure that I can make sense of that statement: Degrees dwarf universities? Whatever. They quickly veer off on some mental gymnastics regarding the quality of online degrees. The infographic people cite the Techcrunch article (and all other citations have nothing to do with the number of graduates) in coming up with their incredibly inaccurate claim about how many students earn their degrees online. I smh and call Bull!! Not all infographics are this poor, but more and more of them are. Guess there’s a lot of pressure when you have to churn one of these out each and every day, lest your page views go down. Oy. On Jan 8, 2013, an organization called Twenty Million Minds Foundation held a one-day conference/ symposium/ discussion/ thingy called “re:boot California Higher Education.” Check out Audrey Watters’ Storify about the whole day. There were several things that struck me about the conversation throughout the day. I’ll pick five of the things that were said during the day and give my own point or counterpoint. #1: Has online learning growth been faculty-driven? Bob Samuels is the President of the University Council (California-based) of the American Federation of Teachers. You can also read his reflections on the day’s events. I have no bone to pick with Dr. Samuels, and I agree with him that the idea that the growth to online learning has NOT been faculty-driven. He says “this is all about reducing costs and making money.” Let me clarify that I partially agree with him but that I disagree with him in total. I agree with him that at the research universities – this move to online has NOT been faculty-driven. The research universities have, for the most part, been brought into the online arms race kicking and screaming. Let’s face it. The online learning growth over the past 15 tears has mainly been fueled by community colleges that want to increase access to education while growing their enrollments and by the for-profit providers who want to increase their profits by growing enrollments. Neither of those two things are especially important on the campuses of our major research universities. Where I disagree with Dr. Samuels is when it comes to community colleges. 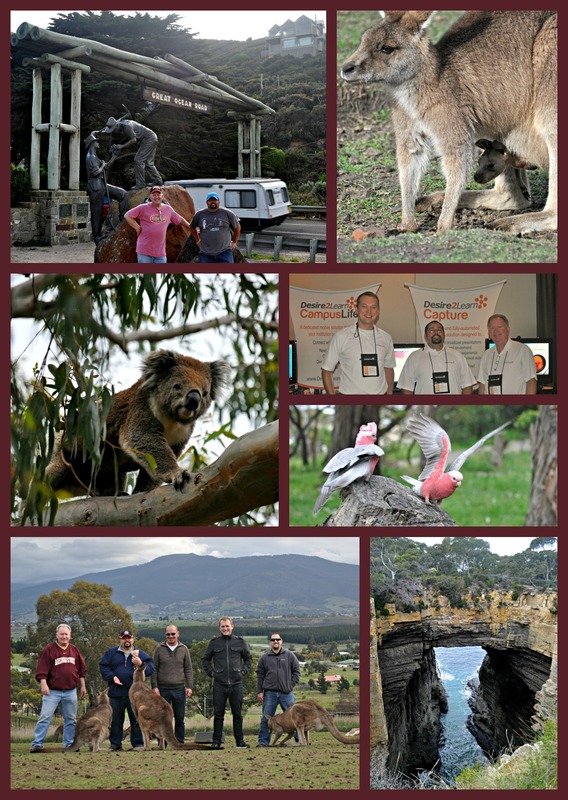 In my experience in Minnesota, and in many other places where I’ve travelled to connect and share with people involved with e-learning; a great deal of the growth in online learning has been faculty-driven. I know a large number of faculty members who have embraced the advantages of online learning while putting up with the disadvantages of such, without any coercion from the dreaded college administrators. The point of this is something that was brought up several times during the day; namely that we cannot paint with such a broad brush to think that there is one problem here and that there will be one solution. Higher education is NOT a single industry. Community Colleges and R1 universities are as different as night and day. Regarding Dr. Samuel’s other point that online ed is “all about reducing costs,” I would have to agree that it seems to be coming down to that during the past year or so. For 15 years of online learning growth, I was never involved in serious conversations about how this would dramatically reduce the cost of providing higher education opportunities. The main focus was increased access to education and flexibility to meet modern lifestyles and schedules. But now, just lately, cost reduction seems to be the major focus. I suppose we can blame the governors who seem to think that a bachelor’s degree should cost no more than $10,000, or maybe we should blame some of the for-profits who (for a while) were making huge profits (and therefore had low costs relative to revenues generated) before they started getting slapped around by Senator Harkin and the like. Whatever the many causes of this shift in the conversation, this is not a good shift. If we focus on online education as being the way to reduce costs, we will certainly lose our way as a global leader in the education market. #2: Will the best MOOC win? I believe the question was asked by Lillian Taiz, President of the California Faculty Association (apologies if it was someone else). Her question related to the MOOC craze, and whether the logical extension (my words, not hers) of all of this would be a single course by a single provider for each needed course title. Thus, will there eventually only be one (presumably the best) Intro to Psychology course, taught by the best instructor in the world, and all the students in the world will learn from the feet of this 21st century reincarnation of Socrates. I’ve been thinking about this question a lot lately, ever since the MOOC craze kicked in. As you can see in the embedded tweet, I remember this same question being asked about 15 years ago. I was a faculty member in Minnesota and attended a state-wide Community College faculty meeting at Normandale CC in Bloomington, MN. There were many big fears about this unknown thing called online learning, and one of the biggest fears was that it would put everyone out of a job. “Why would they take my accounting course when they can take that course from Harvard or Yale or whoever has the best course and instructor?” Some of us thought that those concerns were overblown, but there definitely seemed to be more people who believed it would happen to them than those who didn’t believe it. In the end, will the best MOOC win and everyone else die? NO – not even close. #3: Is Bigger Always Better? This one gets a lot of play. Just remember that there’s always more than one side to consider. Sure, Ng would need 250 years to “reach” as many as he did in the MOOC. The difference between “reaching” and teaching is something that definitely needs to be part of this discussion. The educational opportunity provided to the 100,000 students in the MOOC is very different from the 400 students on campus. The quote above that talks about 250 years is based on some media reports of the AI MOOC enrolling 100,000 students. Other reports say it was as much as 160,000 students – which would take 400 years of the small (400 is NOT small) classes to match. But he also would need about 3,000 years to see as many of his students fail (not succeed or complete) his course as he did in the MOOC. BTW, 3,000 years is just a wild guess – but I feel pretty confident about it. Okay, I’m running out of time here. Three is less than five. I’ll get around to a second post in the near future with a few more items from re:boot. This is a repost from my old business site: Excellence in e-Education (xlents.com). That site is being shut down and I am preserving those items that I don’t want to have disappear. Originally posted April 16, 2012. Recently I saw a discussion thread suggesting that there should be national standards for the delivery of online programs, rather than each of the regional accrediting bodies dealing with the issue. On one hand this may make some sense since online learning doesn’t conform to arbitrary regional boundaries, such as those drawn around the six regions. However, higher ed has a long history of regional accreditation agencies being the authoritative bodies for higher ed accreditation without a single national body (I’m sure you already knew that). There are national accrediting bodies, but they are not as highly respected as the regional bodies. In fact, any school that touts its national accreditation instead of regional accreditation is typically considered second-tier (not by themselves, just by others) because they haven’t been able to attain regional accreditation. Of course the national accrediting bodies will argue strenuously against that point of view. You can easily find those arguments on their websites. I do find it interesting that online learning is one area where there has been a purposeful confluence of thinking by the regional bodies. Through C-RAC (Council of Regional Accrediting Commissions), they developed the Interregional Guidelines for the Evaluation of Distance Education (Online Learning). 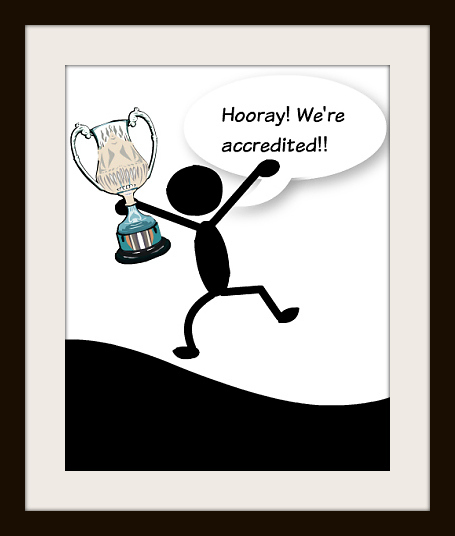 The new Guidelines have been endorsed by all regional accrediting organizations in the U.S.
Live in Minnesota? No Coursera For You! I don’t know about you, but I think that’s hilarious. Minnesota OHE went out of their way to contact Coursera to tell them to keep their cotton-pickin’ hands of those Minnesota residents, or so I’m guessing. This, without a doubt, stems from the ongoing melodrama surrounding state authorization for online education – see WCET summary. 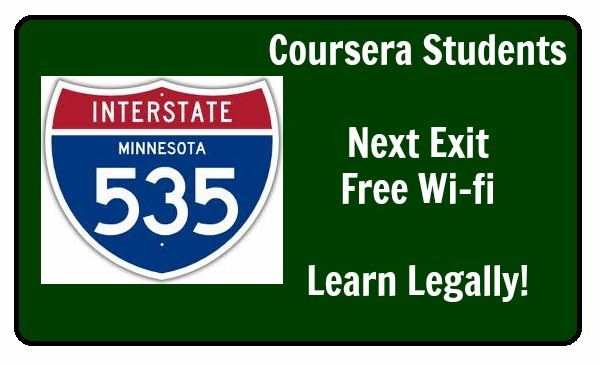 Interesting that the Minnesota OHE apparently reached out to Coursera to inform them of the state statute. Also interesting that Coursera seems to have no interest in paying the fee that the MOHE would require to make this “legal.” Gotta wonder if they have done the same with Udacity, EdX, and the Siemens/Downes/etc Connectivism MOOCs such as the EdFuture MOOC ready to get started on October 8. I’m guessing they haven’t. The legislature has found and hereby declares that the availability of legitimate courses and programs leading to academic degrees offered by responsible private not-for-profit and for-profit institutions of postsecondary education and the existence of legitimate private colleges and universities are in the best interests of the people of this state. The legislature has found and declares that the state can provide assistance and protection for persons choosing private institutions and programs, by establishing policies and procedures to assure the authenticity and legitimacy of private postsecondary education institutions and programs. The legislature has also found and declares that this same policy applies to any private and public postsecondary educational institution located in another state or country which offers or makes available to a Minnesota resident any course, program or educational activity which does not require the leaving of the state for its completion. This looks like a business opportunity. I live in Wisconsin, but only five minutes away from the Minnesota border. People living in Duluth cannot take these courses unless a majority of the work they do for the class will be done from outside the State of Minnesota. My plan would be to open up a coffee shop in Superior with cheap coffee and free wifi so that all Coursera students can gather together to do their homework. Of course, cheating will be strictly prohibited! !